Q. I have started taking my 9-year-old mare to playdays and other events. She is fine when she is with my gelding, but when I try to ride her away from him, she throws a huge fit. She starts screaming for him, pawing at the ground and turning in circles. I have tried different tactics, but she doesn’t calm down. Can you help me? A. To build your mare’s confidence, start by hauling your horses to a place that is familiar and quiet. If you take them to a showground, go on a day when a big event isn’t taking place. Bring a friend to help you. Toss a pile of hay on the ground some distance away from the trailer and allow your horses to eat together if they get along, while each is being held by you and your friend. When everyone is calm, have your friend walk your gelding a few feet away while you keep your mare by the food. Have your friend bring the gelding back immediately and let them both relax. Repeat this a few times until your mare can accept having her companion close by but not within reach. Then try walking the gelding around the mare, again so she can still see that he’s nearby even though he’s moving in a circle. Try to bring your gelding back before your mare loses her cool. You want to avoid having her go into hysterics. The goal is for her to understand that she can remain calm when her buddy leaves her and that he always comes back. If she does get antsy, redirect her attention to you even as your friend is returning with your gelding. Back your mare up, turn her, or walk her forward a few steps when she becomes distracted to reinforce that you are in charge. Remember to keep your voice soft and your movements quiet to help her build trust in you. 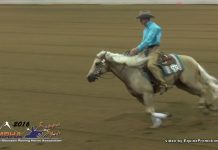 Let your horse progress at a pace that she is comfortable with, and remember to quit while you’re ahead. Offer her lots of praise whenever she relaxes or hangs her head to take a bite of hay. Slowly add more distance between her and your gelding as she becomes more accustomed to being left behind. 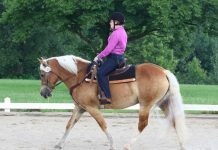 When she’s doing well on the ground, repeat the exercises under saddle. Instead of using food as a distraction, put your horse to work by bending her, riding circles, backing her up, et cetera. Keep her moving yet relaxed. Always bring the gelding back before things get out of hand and your mare will learn that she can rely on you and doesn’t need him anymore. That is very helpful! My mare is very dependant on her pasture buddies. I’ve overcome this same problem with several of my horses by developing a better relationship with them. My thoroughbred in particular was a handful when trying to lead him away from his pasture mates. He now sees me as the leader and willingly follows me anywhere. I follow Pat Parelli’s program, but I’m sure any of the natural horse trainers will give the same info. on how to become the leader in your horse’s eyes.